I was fortunate to spend a weekend learning from some of the best in the industry at the Rangemaster Tactical Conference. 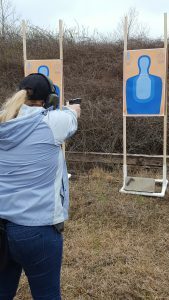 Although my husband and I are not former military or law enforcement we viewed this as an opportunity to get insights on concealed carry and personal protection from people who have spent lots of time “in the trenches” dealing with violent criminals on a regular basis. The conference was amazing and we plan to make it a regular event in our yearly training schedule. 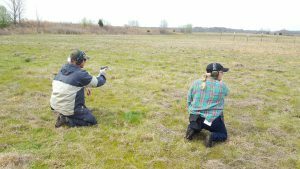 Long distance pistol class with Marty Hayes. Tom and Lynn Givens have built Rangemaster into one of the top firearms training companies in the nation and their network of instructors and associates is second to none. The teaching (and shooting!) talent present at the conference was amazing. Not only were we able to get some valuable instruction but we were also able to witness the different teaching styles and methods of the industry’s best. Below are some of the highlights from what we learned. Having taught thousands of students, Mr. Givens has compiled one of the industry’s most interesting studies of defensive firearms usage as 66 of his former students have been involved in a defensive firearms incident. All 63 who were armed at the time of the incident won their fight and only 3 were injured. The 3 who lost were unarmed and were killed on the spot. Fifty of the incidents took place at 3-5 yards, representing a typical distance for defensive firearm usage. Most importantly, Tom’s student compilation and his own extensive research on crime statistics provided a clear picture of how to structure a defensive firearm training program. Ed Monk has the perfect background to present on this timely topic. He retired from the Army as a Lt. Colonel after a 24 year career, spent 4 years teaching high school, served as a deputy sheriff and is currently a part time police officer in his city. Mr. Monk provided detailed analysis of active shooter incidents from the past few years, comparing and contrasting what succeeded and failed in each event. Most telling for me: in active shooter events where an armed good guy (police or citizen) is present and acts aggressively to stop it, the victim count is in single digits every time. In incidents where the people on scene relied solely on the response from calling 911, the victim count was in double digits, and usually numbered quite a bit higher (30+). On average, 1 person is shot for every 10 seconds an incident is allowed to continue. Defensive pistol class with Lee Weems. Mr. Douglas is a veteran narcotics and SWAT office and has taught entangled shooting skill courses for federal, state and local law enforcement and military. During this presentation, Mr. Douglas ran participants through a defensive scenario to analyze their response for the class. Participants were armed with a Glock 17 loaded with Simunition rounds and were asked to complete a simple everyday errand. While doing so, they were presented with a rapid cluster of activity and forced to respond as they would in real-life. I don’t want to give up many details to protect the integrity of Mr. Douglas’s scenario, but the bottom line is this: if you are ever confronted with a criminal act you should expect it to happen at lightning speed. A critical skill is referred to as thin-slicing – the ability to take an overall snapshot of the situation and make quick decisions based on that limited information. Many of the participants fought auditory exclusion and were unable to accurately recognize important details from the scene. There were a few who handled the situation well and it was obvious they had practiced critical defensive skills like drawing from concealment and issuing verbal challenges. You can bet that we will be adding more scenario-based simunition training into our budget. Mr. Fuller is a highly trained and experienced law enforcement trainer for the Collier County Sheriff’s Office in south Florida and founder of ReadyUp Tactical. During this hands-on seminar, Mr. Fuller showed us the basics of weapon retention for concealed carriers and we were able to practice with each other using plastic dummy guns. Since most defensive gun uses happen at close range, knowing how to hold onto your gun is a critical skill. Mr. Fuller emphasized that simple moves that can be deployed immediately using gross motor skill are effective. His expertise and teaching style allowed us to learn quite a bit in a very short time. One of the coolest ladies in the gun industry, Tatiana Whitlock from GAT Marketing, comes from the typically liberal world of art and design and offered a unique perspective on how to fit ladies with everyday gear. She offered fantastic insight (borderline scientific even!) 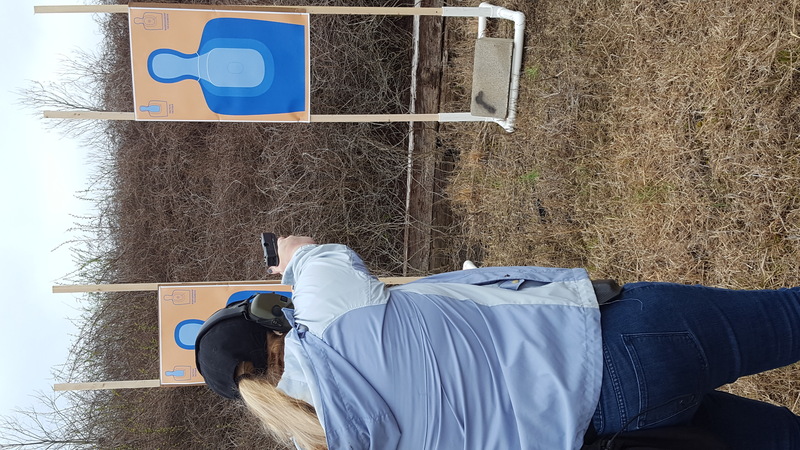 on firearm and holster choices that meet the needs of concealed carrying ladies as well as tips for how to make carrying everyday gear a regular part of life. 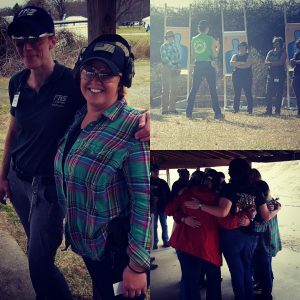 Her experiences meshed with my own in helping ladies choose firearms and gear and helped validate my own effort and time spent building Athena’s Armory. Getting to know many of the best female instructors in the country. We were able to shoot with some of the best and highlights from the weekend included Urban Rifle with John Farnam, a Defensive Pistol with Lee Weems, Long Distance Pistol with Marty Hayes from the Armed Citizens Legal Defense Network and a ladies-only pistol class where I got to shoot with and learn from some of the best female instructors in the country. Of course, the Annual Polite Society Pistol Match allowed us all to compete against each other for bragging rights until next year. I shot well and finished in third place among women, behind Melody Lauer and Lynn Givens. I am looking forward to attending the conference next year and catching up with so many of the great people I met this year.